Venetian blinds have been a popular window covering for decades. The ability to adjust the angle of the blades to control light and provide privacy is the primary advantage of venetian blinds. Blindmaster offers venetian blinds in a broad range of materials including western red cedar, composite timber, synthetic material such as polystyrene and aluminium. All are finished in a broad range of colours and styles to suit your home or office. Venetian blinds are primarily cord operated however some can also be motorised via remote control or controlled via your building management system. 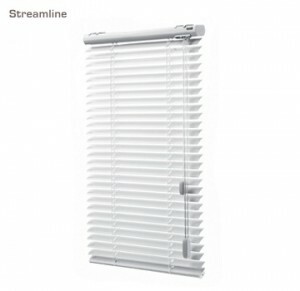 The Verosol streamline aluminium venetian blind is regarded as Australia’s most versatile venetian blind. European designed and Australian built, the streamline venetian uses aluminium head rail and base rail for strength and corrosion resistance. The slats are extra fine yet extremely strong. Streamline venetians can address a variety of applications such as top sloping, mono control, between glazing, wire guiding and motorised operation. 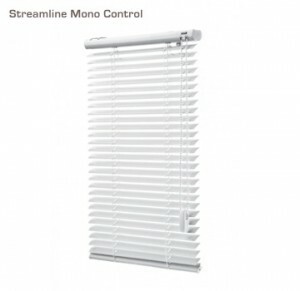 Streamline venetian blinds are also offered in a mono control with front exit continuous chain that controls both tilting and raising/lowering of the blind. Motorised venetian blinds incorporate a 24volt DC motor concealed inside the head rail and can be integrated into building management and home automation systems as well as hand held remote controls. ESR Western red cedar blinds are manufactured using a slat with an average thickness of 4.0mm for superior stability and the ability to minimise bowing, warping and splitting as opposed to other timber blinds made using a range of 2.6mm – 3.0mm. Available in 34mm, 46mm, 60mm and 85mm slat widths and either oiled, lacquered, stained or painted finishes and a width of up to 3600mm. Western red cedar blinds will enhance any decor with the wider slats offering uninterrupted views with clean simple lines. Western red cedar is renowned for its superior performance characteristics being light weight yet strong. Available in manual operation only. ESR New York lifestyle are polystyrene blinds and combine a unique sense of style and sophistication. The stability of polystyrene blind technology has been well proven over many years. Available in a range of stylish colours in both smooth and embossed finishes, 50mm and 63mm width slats with a wide 82mm deluxe fascia and a width of up to 2700mm. New York lifestyle is suitable for use in all areas of the home or office, including wet areas. Available in manual operation only. ESR New Tone is a revolutionised timber product that has been specifically designed for Australian conditions. Made from 4.0mm thick Western Red Cedar that is coated with a UV lacquered curable coating to offer the best protection against fading in our climate. The unique toning process adds beauty and uniformity throughout the blind. Available in both 46mm and 60mm width slats in white and antique white, light, mid and dark tones and a choice of standard or deluxe fascia and a width of up to 3600mm. Available in manual operation only.